Tarot Terrors: Book 3, The Games We Play by Linda Pirtle is about a deep state government trying to take over America. Lillian Prestridge’s husband is murdered and she and her son, Grant, who is working for the FBI, go out to find the killer. Lillian was trained to be a detective. Her sidekick poodle helps her along the way, as well as a medium and a Native American family assisting, or do they? An old friend, who also works for the FBI, is already on the case and vows to avenge his friend’s death. You don’t know how far the deep state goes or who to trust. Lillian only trusts her son, her dog, and her new friend, Sammie, who is part of the Native American family. 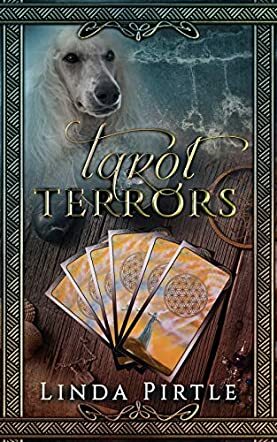 I thought that Tarot Terrors by Linda Pirtle was fascinating. I loved that it was book 3 in The Games We Play series, but I didn’t feel lost reading it, since I didn’t read the other two previous books. The characters were intriguing. My favorite was Simon. I am usually pretty good at guessing who is the bad guy, but he was a mystery to me, and I loved that. Using the Native American folklore was also a nice touch. I liked how Linda uses older characters. Most of the cozy mysteries are about 20-somethings, and it’s hard for me to relate to them. I also loved the twist that Linda Pirtle put in at the end. I usually don’t get surprised, so I was impressed. I am definitely going to have to read the first two books now to catch up!